Blackpool is located on the north-west coast of England and has earned the title of Britain’s favourite seaside resort. 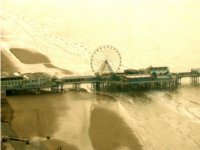 Its origins as a tourist destination began in Victorian times when people from all over England would travel to Blackpool to experience a day at the beach, pier-side wooden rollercoasters and a theatre show. Nowadays, Blackpool is undoubtedly most famous for its yearly event – the Blackpool Illuminations, which attracts over three million visitors per year. The illuminations is a giant light show featuring large and elaborate displays, famously described as ‘artificial sunshine’ because of its brightness. The illuminations normally run from late August to mid November. Other highlights of Blackpool include: the Pleasure Beach which hosts the tallest rollercoaster in the UK; Blackpool tower which allows for great views over the whole city and Blackpool Zoo which features over 1000 different animals. Blackpool is the ideal city to embark on a walking tour, it is perfectly built for strolls along its lengthy promenade. Blackpool has a thriving night-life and a well-known reputation for being one of the best nights out in the UK. With both friendly pubs and bouncing nightclubs to choose from, there is a large variety of night time activities. There are over 30 night clubs in Blackpool so there is no lack of choice! Blackpool allows for a unique shopping experience – a browse of the shops while walking alongside the sea. Blackpool’s town centre, located behind the Blackpool Tower, is a mixture of everything from market stalls to large shopping centres. The Houndshill Shopping Centre contains all the English High Street favourites, such as Primark and The Disney Store. For a variety of independent shops, head towards Abingdon Street Market located at the back of St John’s Square. Also, there are regular markets that take place at various times of the year – mainly summer – such as Bonny Street market offering copious home-made goods. If shoppers get tired on foot, there is the option to hop on the tram from shop to boutique! One of the main sights to see in Blackpool during your stay is the The Blackpool Tower, built in 1894. On the outside, it is a unique sight of architecture and looks like a smaller version of the Eiffel Tower in Paris. On the inside, there is the opportunity to learn the history of the building in a 4D cinema experience. Additionally, visitors can visit the Blackpool Tower Dungeon located beneath the Tower and learn from a collection of storytellers the history of wider Lancashire & Blackpool. There is also the opportunity to see Blackpool on an open-top bus tour. Blackpool has typical English coastal weather – light breezes and occasional showers. However, it can get quite hot in the summer with July being the hottest month with an average temperature of 16°C (61°F) and up to 8 hours of sunshine! The coldest month is February when temperatures drop to 4°C (38°F). Blackpool has train, buses and tram services. The easiest way to travel across Blackpool is by bus or tram as both are frequent and easy to use. The bus system is colour and number coded by route, and the buses are different colours so its not easy to get mixed up! The tram service runs along the sea front from one end to the other.